An oocyte is an immature egg (an immature ovum). Oocytes develop to maturity from within a follicle. These follicles are found in the outside layer of the ovaries. During each reproductive cycle, several follicles begin to develop. Typically, only one oocyte each cycle will become a mature egg and be ovulated from its follicle. This process is known as ovulation. A woman is born with all the oocytes she will ever have. This number decreases naturally with age. Age also reduces the quality and genetic stability of the oocytes. This is why it's harder to get pregnant after 35. The fully mature ovum is visible to the human eye, measuring 0.1 mm. It is about the size of the period at the end of this sentence. During fertility treatments, the doctor will conduct ultrasounds to monitor follicle growth. The oocyte maturation is also taking place, but oocyte maturation is not visible on ultrasound. This is why follicle growth is observed and not oocyte growth. If too many follicles grow, your treatment cycle may be canceled to prevent the risk of multiple pregnancy or ovarian hyperstimulation syndrome (OHSS). During IVF, if ultrasound monitoring does not show enough follicle growth—which means not sufficient oocytes are maturing—the cycle may be canceled to avoid treatment failure. Alternative spellings: oöcyte, ovocyte, ocyte. Oogenesis is what an oocyte goes through as it develops into a mature ovum. You may assume that oogenesis occurs over the course of a month since that is how often you ovulate. But you would be wrong! While it is true that whatever egg is ovulated completes the oogenesis process the month it is released from the ovary, oocyte development began way before you were even born. In fact, it started when you were a very young embryo. These are the stages of oocyte growth. The “seed” cell of every oocyte is the primordial germ cell. These are embryonic cells that will eventually become either sperm or oocyte cells. In the developing embryo, these cells move into the area that will eventually become either the testis or ovaries (also known as the gonads). Oogonia are diploid cells. This means they have two (di) complete sets of chromosomes. In the human cell, this is 23 pairs or a total of 46. During the first five months of prenatal development, the oogonium increase in number through a process known as mitotic cell division. Meiosis is unique to germ cells. It only occurs in young egg and sperm cells. In more typical cell division—which known as meiosis—cells duplicate by creating clones of themselves, each with a full set of chromosomes. For example, one skin cell going through mitosis would eventually lead to two skin cells, with similar genetic codes. Unique chromosomal sets: every oogonium that splits creates unique sister cells. This means that no one oogonium shares the same chromosomal makeup as another. This mitotic division is why every new life has a unique genetic make-up that is unlike anyone else. However, it is not completely random. It is all based on the original genetic material the embryo received from its father and mother. These cells continue to multiply until reaching their peak. The peak occurs when the developing fetus is about five-months-along. At this point, the girl fetus has 7 million oocytes. This number will begin to decrease after this point. At birth, a baby girl has only 2 million oocytes left. Every oocyte will go through two separate meiotic cell divisions before becoming a mature ovum. Meiotic cell division leads to growth and maturity of the oocyte, and not additional oocytes. Towards the end of prenatal development, the oocytes stop multiplying in number and begin to mature individually. At this stage, they go through the first meiotic cell division. This cell division leads to oocyte growth—not more oocytes—like what happens with the oogonium. But they don’t just speed through development to maturity right now. The primary oocytes freeze in their development and remain frozen until reproductive hormones trigger the next stage. Oogenesis will continue at the age of puberty. Puberty jump-starts the next stage of oocyte maturity. Not all the oocytes will go through these later stages of oocyte development together, of course. They more or less take turns over a woman’s reproductive years. Each month, a new set of primary oocytes begin to mature. Once a primary oocyte is affected by reproductive hormones, it completes Stage I of the meiotic cell division. This is known as oocyte maturation. At the end of this first stage of meiotic cell division, the cell splits into two separate cells: a small polar body and a large secondary oocyte. The small polar body eventually deteriorates. The secondary oocyte begins the next stage of maturation. The oocyte now begins the second phase of meiotic cell division. Eventually, the secondary oocyte will split again into two separate cells: another small polar body cell and a larger mature cell. This larger mature cell is known as an ootid. As before, the smaller polar body cell will eventually deteriorate. Ovulation occurs when the oocyte has reached the ootid stage of development. At the time of ovulation, an ootid is released from the follicle. Human egg cells cannot move on their own. Instead, finger-like projections draw the oocyte towards and into the fallopian tube. 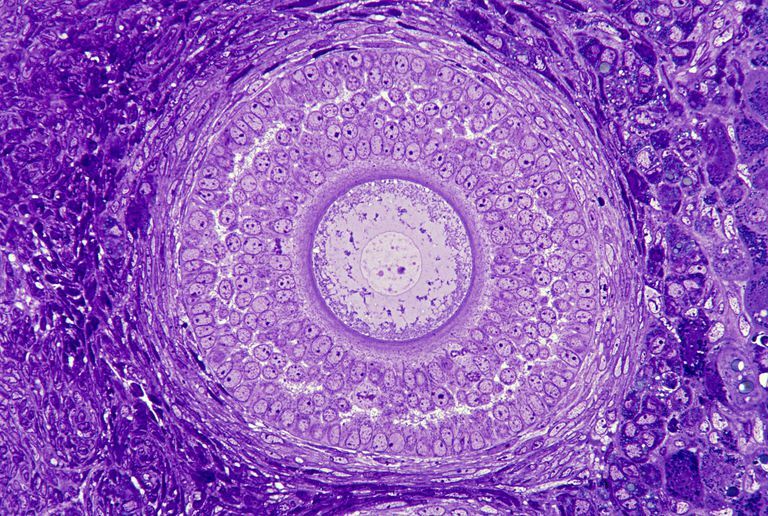 Once inside the fallopian tube, small hair-like projections known as cilia continue to draw the ootid along. In the fallopian tube, if pregnancy occurs, the ootid is fertilized by a sperm cell. Once this fertilization takes place, the ootid goes through its final stage of maturation and becomes an ovum, a fully mature human egg cell. That's right; the oocyte actually can’t complete its full development without fertilization. During fertilization, the ovum and sperm cell combine, each containing 23 chromosomes each. Rather quickly (but not at the exact moment of fertilization), these chromosomes fuse together, creating a new cell with a full set of chromosomes. This new cell is called a zygote. The zygote will develop into an embryo and, about nine months later, a newborn baby. Grudzinskas, Jurgis Gedimina; Yovich, J. L. Gametes - The Oocyte. Cambridge Reviews in Human Reproduction. 1 edition, 1995. Pages 9 to 10. White YA1, Woods DC, Takai Y, Ishihara O, Seki H, Tilly JL. “Oocyte formation by mitotically active germ cells purified from ovaries of reproductive-age women.” Nat Med. 2012 Feb 26;18(3):413-21. doi: 10.1038/nm.2669.